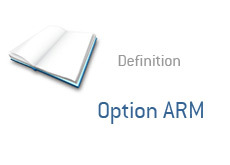 Option ARM - What Does It Mean? What is an Option ARM? What is the definition of an Option ARM? To start with, let's define ARM. ARM stands for Adjustable-Rate Mortgage. The "option" part of this comes from the fact that homeowners have an option as to three different types of payments that they can make when they initially take an Option ARM mortgage. 1. Make a standard payment that will cover the principal and the interest. 2. Make a payment that will cover just the interest. 3. Make a "minimum" payment that will cover neither. If homeowners choose option #3, then something occurs that is known as "negative amortization". This is when the principal increases with each passing month, due to the fact that the homeowner isn't paying enough money to even cover the interest on the mortgage. With option ARM mortgages, there is a "cap" - once the cap is hit, the mortgage recasts. The cap is usually set at 110-125% of the original principal amount - this means that once the mortgage grows to 110-125% of the original mortgage amount, then the mortgage "recasts". "Recasting" is when the payments in the mortgage change. When an option ARM recasts, the new mortgage payment amount will go towards both the principal and the interest, just like in a standard mortgage. This new mortgage is usually much higher than the original (50-100% higher in most cases). Note: Option ARMs automatically recast after five years, even if the initial "cap" isn't hit. Option ARM mortgages were popularized during the real estate boom of 2004-2007. They were mostly utilized by people who really couldn't afford the homes that they were buying in the first place.